Editor-in-chief Sam Grawe offers his San Francisco apartment as a staging ground for a couple LivingColors lamps, and we asked associate photo editor Alexis Tjian to set up a few color-saturated vignettes. Check out our slideshow to see the illuminated result. In the living room, the LivingColors lamp, though obscured from view by a Knoll sofa by Charles Pfister, mimics the bright warm tones of the Max Bill poster. 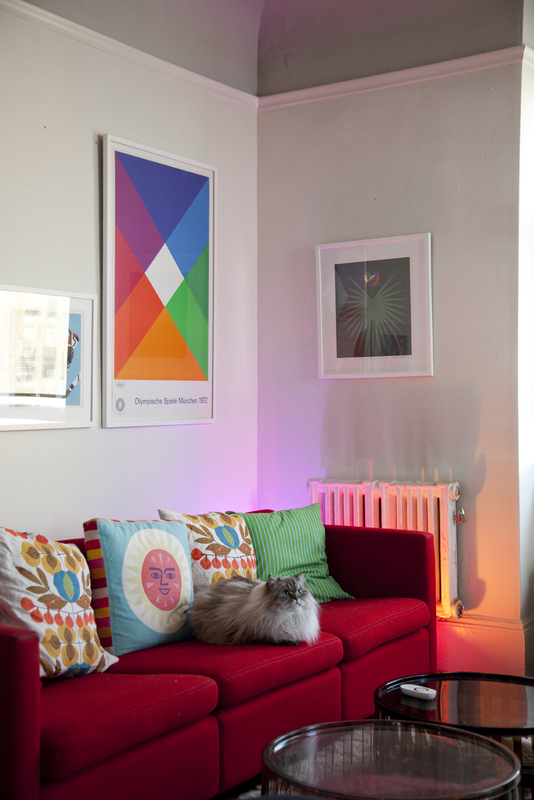 Grawe's cat, Eero, settles in amongst a collection of both vintage and contemporary pillows. A LivingColors lamp, resting next to a blowfish-shaped Japanese lantern, emits a concentrated beam of red light beneath a silk-screen print promoting Osaka's Expo '70. A refracted pastel glow from a LivingColors mini filters through an Orkidea vase created by Timo Sarpaneva for Iittala. The silver candlesticks are from Georg Jensen; the silver bud vase is vintage, by Tapio Wirkkala. Grawe, a musician, grouped a collection of artifacts from his travels around the world near his vintage keyboards and drum machines. The LivingColors lamp highlights the crannies of the room's built-in shelving. A pair of LivingColors minis work in concert to create a dramatic setting atop a vintage rosewood sideboard from Denmark. A warm glow infuses a trio of Festivo candlesticks by Timo Sarpaneva for Iittala next to a LivingColors lamp. The floor lamp is by Arne Jacobsen. A mixture of blue and green hues, from a LivingColors lamp hidden behind a large philodendron, complement a Jonah and the Whale print by Edie Harper in a corner of Grawe's living room. The floor pillows are from the Rug Company. LivingColors minis create colorful alcoves within Grawe's stuffed-to-the-gills bookcase. If you're interested in creating your own moody atmosphere using Philips' LIvingColors lamps, be sure to check out both in the series, the LivingColors lamp and the LivingColors Mini, below.